A quality facial exfoliator is an essential part of one’s skin care regime. A decent face scrub will not only remove the dead skin layer to make the skin clearer and reveal a brighter complexion, but it is also responsible for stopping ingrown hair. Some of the hair can get stuck under the dead skin cells, which then finds the way of least resistance which leads to the hair growth beneath the skin surface that causes unsightly breakouts and irritation. 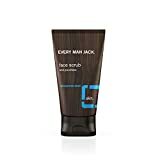 As we are talking about the importance of facial scrub, here is a review of Every Man Jack Face Scrub to check its performance. The good thing is that this amazing face scrub contains no harmful ingredients. The brand claims that it doesn’t use parabens, sodium lauryl sulfate, phthalates, and dyes in any of its products. They are not tested on animals as well. This product contains coconut-derived surfactants that clean the skin deeply and jojoba beads that function as the main scrubbing particles and eliminate dry and dead skin. Moreover, it possesses vitamin E and marine extracts that soothe and moisturize the skin. The texture of the formula is neither too runny nor too thick. It has the perfect consistency that most people like. That’s the same case with its scent. It has its signature mint fragrance that is neither too strong nor too weak. The mint scent also plays a useful role in keeping the skin refreshed and cool. This face scrub comes in the Every Man Jack’s signature bottle. It is a black tube-like, upside-down bottle with uneven and dim brown strips. The text written on it is with white and blue colors that make it look manlier. Also, it has a flip-open, black-colored cap that helps the bottle stand upside down. This facial scrub renders exceptionally great performance. As it is made with high-quality, natural ingredients, there is no way it is going to give you odd or harmful results. After applying the face scrub, we felt a fresh feeling on our face, which must be because of mint. This coolness provides more ease while scrubbing as it lessens the abrasiveness and harshness. Besides, the jojoba beads remarkably clear the whole face, which makes it easier and quicker to shave. This product is perfect for using before shaving since it makes the skin less sensitive to shaving and helps prevent ingrown hairs by removing dead skin. Possesses a cool mint fragrance. Makes skin less sensitive to shaving. Some people might not like the minty smell. Customers have said that this product has the perfect consistency and smell. Moreover, it leaves their face smoother, clearer, and free of impurities. According to them, it is the best pre-shave product. Undoubtedly, Every Man Jack Face Scrub is a must-try for anyone looking for a natural and mild abrasive pre-shave scrub.